People who have been driving for many years are prone to fall into unsafe driving habits, and engage in risky practices without even recognizing the behavior. Let’s face it, we get comfortable with our abilities, and driving becomes as natural as walking. Of course, walking is a lot less dangerous. Once driving becomes second nature to us, it’s easy to fall into a pattern of being a bit less vigilant and mindful when on the road. Here are some of the unsafe habits and common mistakes made by seasoned drivers that could potentially lead to an accident. Some experienced drivers choose to ignore bad weather, such as snow, rain, and icy roads. They continue to drive at the same speed and distance that they do in clear weather because they falsely believe that their experience will prevent them from causing an accident. During periods of clear weather, all drivers, regardless of experience, should honor speed limits and maintain a minimum of three seconds between their car and the cars in front of and behind them. In inclement weather, the distance should double (at a minimum), and speed should be reduced anywhere from 3% to 64%, depending on the weather and your location, according to the U.S. Department of Transportation’s Road Weather Management Program. We all have somewhere to be, and people who have been driving for years believe their experience behind the wheel gives them additional insight and the ability to expertly gauge traffic and traffic signals. So, they rush through yellow lights, even when they have time to safely stop. This dangerous habit should be avoided. If a traffic light turns yellow and you have time to stop, then stop. Traffic lights change to red too quickly, and if you are in an accident, you could be cited for running a red light. The two minutes you save is not worth the risk. Other drivers can’t read our minds any more than we can read theirs. When we turn unexpectedly, other drivers, pedestrians, and bicyclists must adjust in an instant. Not only is the use of directional signals legally mandated, but when you signal your intentions to others, you could be saving lives in the process. 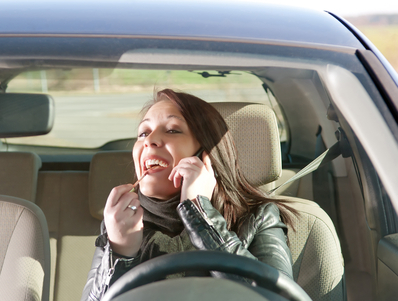 Distracted driving is a deadly habit that many drivers fall into, whether they are new or experienced. Perhaps a driver who has been licensed for years feels that his time behind the wheel means that he is experienced enough to be able to simultaneously drive while texting, changing the radio, or eating. Of course, that is just not the case. When someone drives while distracted, his response time slows to that of someone who is legally intoxicated. Approximately 9 people are killed and more than 1,100 people are injured every day in the United States as a result of a distracted driver, according to the CDC. Do not allow your driving experience to falsely convince you that you are capable of engaging in any other activity while you are driving. If you are involved in a car accident, there are important steps you should take immediately, as outlined at Lawyer1. But, not getting into a car accident in the first place is obviously the goal. While you can’t always avoid an accident, you can do your part to ensure that you do not cause one. If you are an experienced driver, take time to evaluate your driving, and cut out any unsafe driving habits. * Picture by Big City Driver.